What if music could help you celebrate the stages, not just the ages, of your child's development? Kindermusik is an early childhood music and movement program based on beliefs that every child is musical, every parent is the child's most important teacher, the home is the most important place for learning to take root and grow, and that based on research, music nurtures a child's cognitive, emotional, social, language, and physical development. From birth to five years of age, your child can grow with Kindermusik North Shore without the pressure to perform, only encouragement to explore, express and discover. You'll see a developmental evolution in language skills, literacy, problem solving, social skills, self-esteem, and musicality! Not sure which class level is appropriate for your child? Here are some helpful guidelines for transitional ages and stages. ...provides the natural learning your child is ready for from the first days of life. With you at the center of your baby's discovery,Village engages all his senses and rewards his curiosity with object and instrument exploration, vocal play, singing, massage, creative movement and a colorful literature component. Multi-level activities encourage you to make creative choices as he grows from a lap baby to a crawler to a walker! 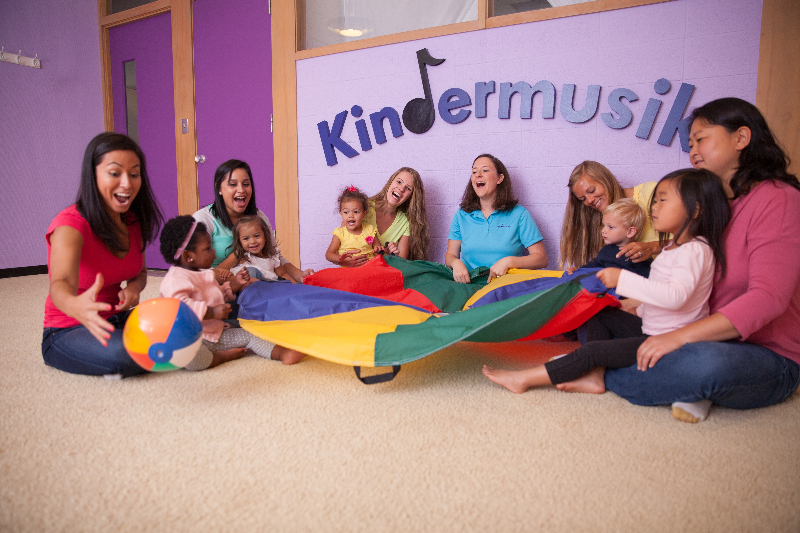 You'll have a wonderful time in Kindermusik Village classes bonding with your child and you'll be surprised by how much you can learn while having so much fun. 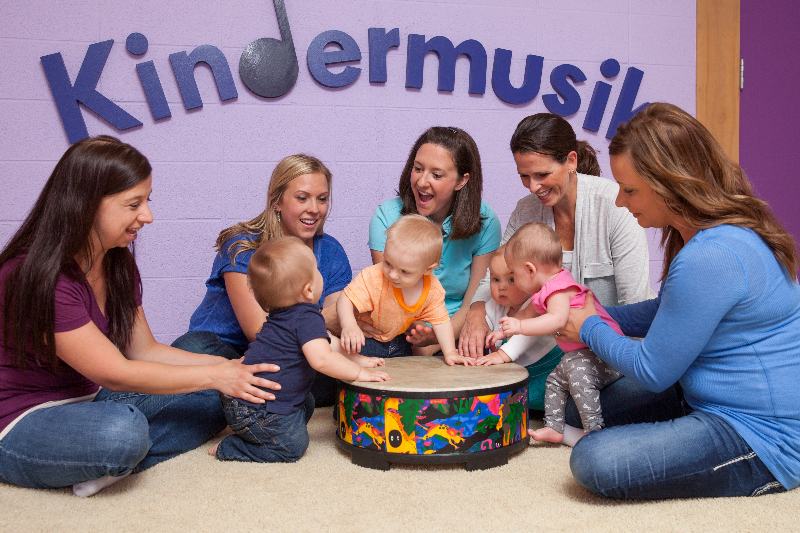 Throughout your classroom experience you'll learn how activities stimulate development in every area of you baby's brain.Kindermusik Foundations of Learning are woven throughout the lessons and are included on home activity cards that will extend your knowledge about how your baby is growing and how you can nurture that development. Hickory Dickory, Tickle and Bounce and Rhythm Of My Day. ...focuses on your child's healthy emotional development as her confidence, curiosity, self-control and communication begin to shape. Instrument exploration nurtures her self-esteem and facilitates her discovery of textures and sounds. Language skills are fostered with singing, sound imitation, rhyming, finger games and object identification. Creative dancing to different musical "moods" develops her sense of balance, timing and spatial awareness while affirming her urge to move. The anticipation and rewards of focused listening are introduced, and with turn-taking activities, social skills begin to blossom. Our Time provides the framework for meaningful interaction between parent or caregiver and child. The activities encourage her to experiment while your active participation will give her the security she needs. Required home materials include: Two full-length CDs, two Music and Movement Books, a Home Activity Book, and a specially designed instrument all in a themed lunch bag. ...is a curriculum specifically for 3 to 5 year-olds. It has been developed using the most up-to-date research which confirms that pre-school age children thrive on participatory, expressive learning. Through a carefully integrated curriculum of music, pretend play, literature and lots of creative movement children will reflect, compare, make choices, express opinions and solve problems while letting their imaginations soar. No two classes are ever the same and class activities grow and change based on the children's active participation...Imagine That! Required home materials include: Two full-length CDs, Family Activity Book, professional resonator bars, two literature books and a pretend play manipulative component. Classes begin the week of January 28, 2019 in all 5 park district locations. Register through the location you'll be taking the class at---website links to register are on the next page. If space is available, register any time during the semester and the fee will be prorated. Vernon Hills: Mon 12:30 NEW!! Lake Forest: Friday 11:30 NEW!! Registration for our classes must be completed through the park district or organization website where you'll be attending class. "Miss Cathy" is a recent Bucktown transplant after playing suburban wife and mother of 2 for 25 years. Cathy's theatrical home is Big Deal Productions in Buffalo Grove where she appeared in Steel Magnolias, Seussical and Annie. She has music directed many shows for Big Deal and Bannockburn School. Cathy is a Board member with Chicago Cabaret Professionals and has performed several solo cabaret shows to sold out crowds at Davenports, Skokie Theater and recently Stevenson High School with her Linda Ronstadt tribute show. She continues to be a diverse vocalist singing everything from Classical to Billy Joel at Carnegie Hall and the Park West. In 2005 "Miss Cathy" recorded her solo CD entitled Mornings With Miss Cathy of mostly original children's music to WORLDWIDE rave reviews from children and adults. As of January 2018, Miss Cathy is the proud new director of Kindermusik Northshore. She is excited to take this new adventure in her life. "Miss Kat" is the newest Kindermusik Educator at Kindermusik Northshore having recently completed the extensive licensing training through Kindermusik International. She started her musical journey at 5 years old learning piano and performing in the school's productions and choir and fronting her brother's rock and roll band during high school. Katherine obtained her Bachelor's Degree from The Illinois Institute of Chicago in fashion marketing and management with a minor in fashion show production . She learned quickly after graduating in 2004 that the fashion industry wasn't a good fit for her. Miss Kat decided that she wanted to teach and help children with special needs. In addition to tutoring and music therapy involvement, she became a paraprofessional for Northern Suburban Special Education District (N.S.S.E.D) for 7 years. She believes music helps all children express themselves! Miss Kat is a former Kindermusik parent to Lindley (4 yrs) and Arwen, (1 yr) and lives with her husband Nic in HIghwood. Miss Kat was inspired by her children's Kindermusik teacher, Miss Cathy (Glickman) to teach for Kindermusik Northshore. Kara Spector has been a local music educator for over 15 years. She graduated with honors from Northwestern University with a BM in Music Education and a BA in Creative Writing, and later received her MAEd in Gifted Education from Northestern Illinois University. White at NU, Kara was conductor of the SAI Music Fraternity for Women's Beta Chapter Choir. (where she was both a Sword Of Honor recipient and College Honor Award Recipient), and the assistant conductor of the Cantores Minores Chicago Boys Choir. Her career began with a decade as a public school music, language arts and gifted education teacher. During this time, Kara also fostered her passion for teaching and performing in musical theatre and has since enjoyed a long standing relationship with Big Deal Productions where she frequently works as a music director and choreographer in children's musical theatre productions and Broadway bound camps and the music director of Crescendo Show Choir. (Sometimes you can even catch her onstage!) Kara also maintains a private voice studio of over 30 talented young singers from across the Northshore. Her Kindermusik journey began when Miss Cathy, a friend from the community theatre scene, invited Kara and her new babies to class, and the rest, as they say, is history. She is delighted to bring the joy of Kindermusik to you and your children. Diane Naftzger is the founding director of Kindermusik of the North Shore. She has been a fully licensed instructor since 1997. Her musical training began at an early age in piano, violin, and voice. She obtained her B.S. from Arizona State University and was selected for the University Choir there. She has performed in numerous musical productions in the western United States. Upon moving to Chicago, she was an instructor at the prestigious Music Institute of Chicago in Winnetka. She currently resides in Lincolnshire with her husband and two children. Kindermusik Northshore is proud to be recognized as a global Top 5% program. We have achieved this recognition every year since the award's inception.